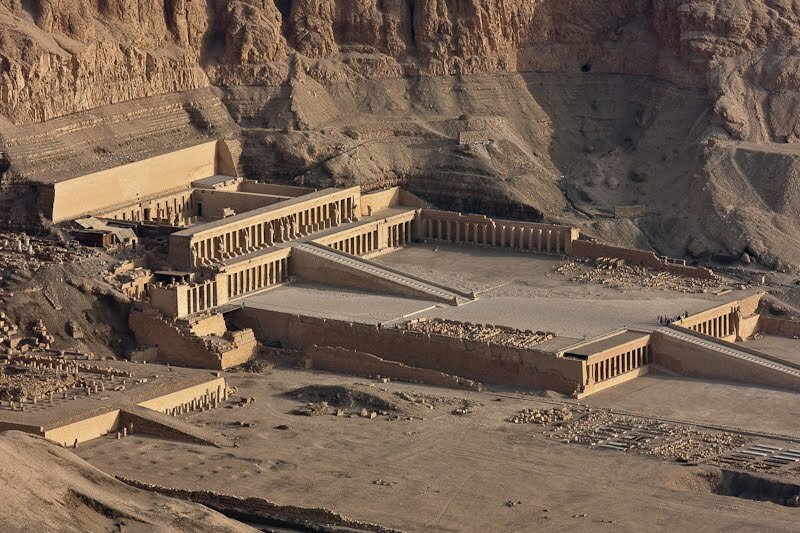 After the Valley, we headed over to visit Hatshepsut’s Temple – the one we saw so clearly from the balloon. She was the only female Pharaoh and made a few people mad in getting to that position. So, unfortunately her temple was heavily defaced. They just chiseled away any carvings of her and her name. Its a shame but the structure itself was still rather unique! We also became celebrities again as another group of girls wanted a picture with us. This time we were wise enough to get their pictures as well! Notice the clear divide between the girls and Josh, while the one girl happily put her arm around me! Its evident that men and women don't associate like were are used to. 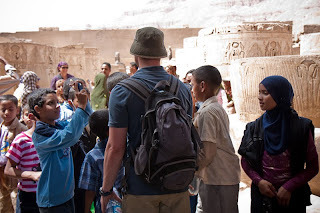 After the paparazzi session, we headed back to the bus for yet another temple – Medinet Habu. Besides being our tour leader Sam's favorite, it's special because the hieroglyphics were so deeply carved. Josh could put his whole fist in some of the holes. This was a stark change from the small carvings at other temples we'd seen thus far. 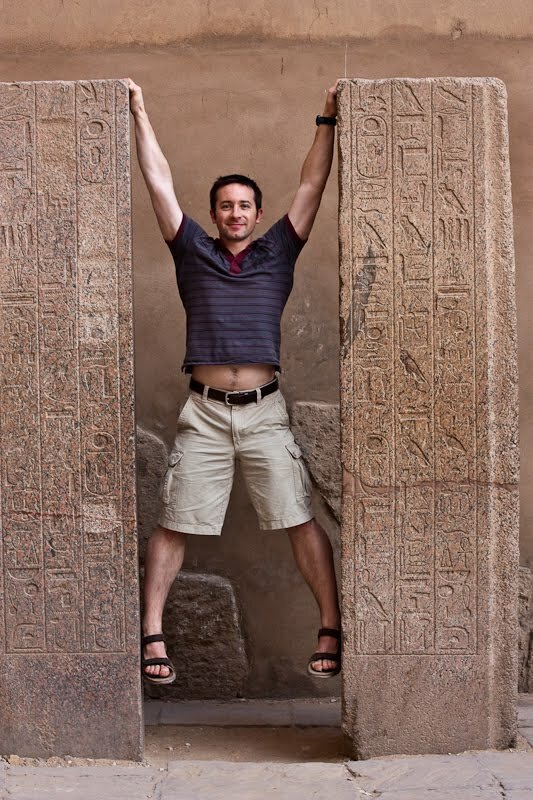 In fact, you could probably climb the walls using the hieroglyphics as hand and foot holds. Too bad Sam vetoed that idea because it sure would have made for some good photos. Exploring the temple we ran into a big group of young school children on a field trip. With one hello Josh was swarmed by the group. I looked up and he was being mobbed, in a good way, with interested kids shaking hands, saying hello and taking photos of him with their phones. Luckily I was able to act quickly and get a few photos of him in action. He was great, greeting everyone of the 30 or so kids, even posing for photos like a pro. Afterwards he was gushing from the attention. The fact that all of the kids were so interested to meet him was unbelievable and totally unexpected. My favorite part was when a young girl, in pink, was trying to take a picture of Josh with her camera phone. Walking past she was starring at the screen of her phone waiting for the perfect moment, exactly like taking any old picture of a statue in the temple. Except it was Josh! Then there was Josh starring back at her smiling just soaking it up. Our celebrity status was now at an all time high. We had a few other photos with other temple visitors too before heading for the exit. Good show! After the temple tour, we were invited for a lunch feast at our local guide’s home. It was all home cooked by his wife and was delicious! When we could eat no more we moved over to the couch seating area to have some tea and hear about local wedding customs from our host. When ready to marry the man first looks in his family, then looks among neighbors, then among friends or other acquaintances while trying to select a bride. Remember Men and women just don't associate as freely as we are used to so they will have possibly never met. Its all well to complicated for this blog but they do throw some big village parties and have a good time celebrating. Very Interesting none the less. With lunch over we hit up the obligatory papyrus shop to "see how papyrus was made". Not wanting the hassle of trying to get a "good price" at a bazaar we picked up few pieces including a blue Egyptian Cat. Our cats are sure going to be jealous. This amazing day was nearing an end…but wasn’t over yet! We used our little bit of free time before our overnight train to Cairo to visit the Luxor Museum. What a surprise this little gem of a museum turned out to be. 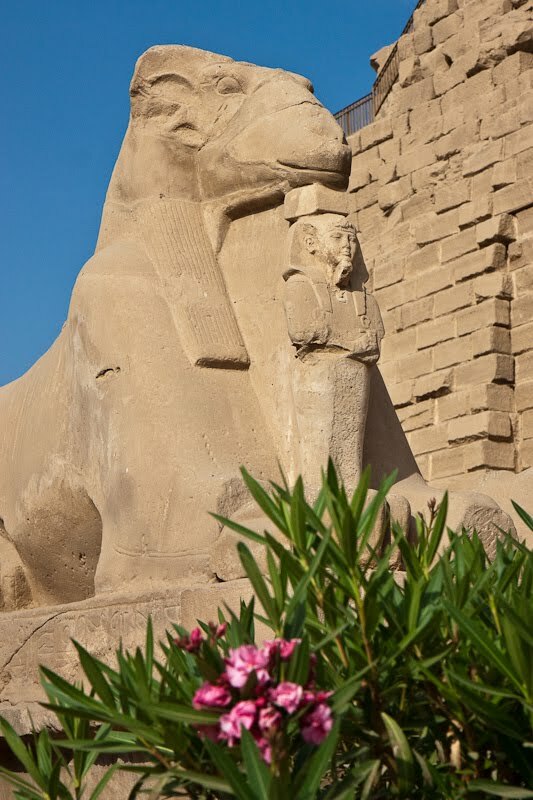 Compared to the The Egyptian museum in Cairo which is dingy, dusty and Egyptian artifact overload, The Luxor Museum was a clean, modern and air conditioned museum with only100 main pieces all exquisitely displayed. One of the best displays were two ancient Pharaoh mummies. Its hard to describe how spectacular they were but the bodies were in such good condition, even in orginal linens. You could see their shriveled toes and fingers and stare in to their leathered face, complete with hair still on the head. Wow. It’s amazing that even with all we know in the current age, we can’t reproduce this level of mummification! Can you believe we saw all that in one day?! After such an intense day, we actually slept soundly on the seater train back to Cairo! Whew! This day’s fun had only begun. After the hot air ballooning and donkeys, we still had much to do, starting with a visit to the Valley of the Kings! What a surreal place. 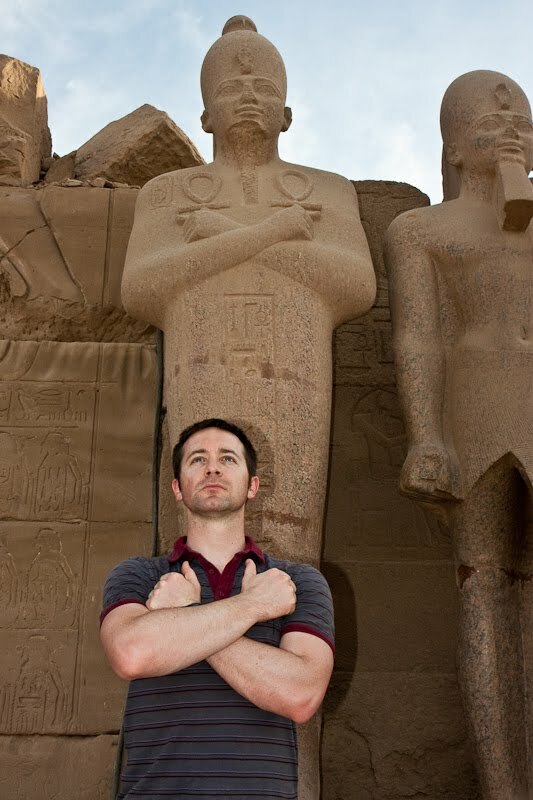 So many important pharaohs all buried here thousands of years ago in what was supposed to be a safe place to carry them to the afterlife. Entering the valley you get a feel for the scale of the place and you can see why they chose it to be the final safe resting place. First off, its remote, rugged and HOT! 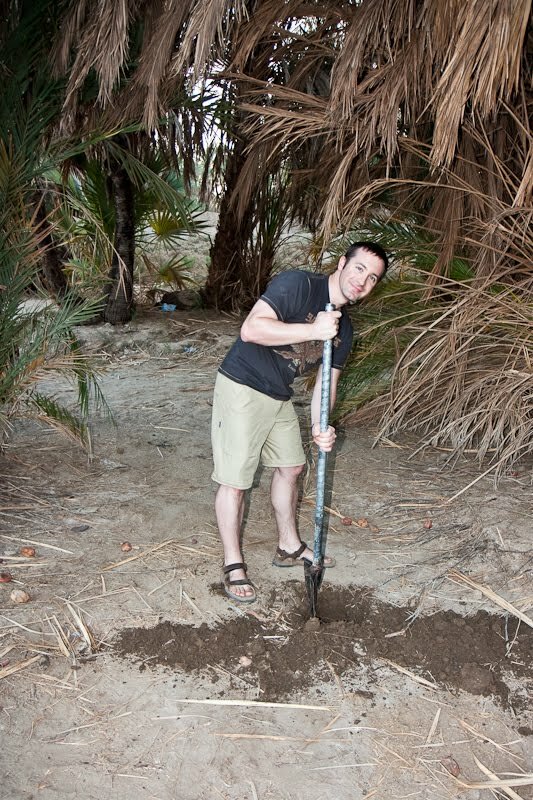 Its outside Luxor's fertile Nile plain which quickly turns to desert that doesn’t seem to end. Second, the mountains surrounding the valley resemble pyramids, which are the iconic, albeit impractical/obvious resting place for pharaohs. So included in the entrance was admission for three of the many tombs at the site. 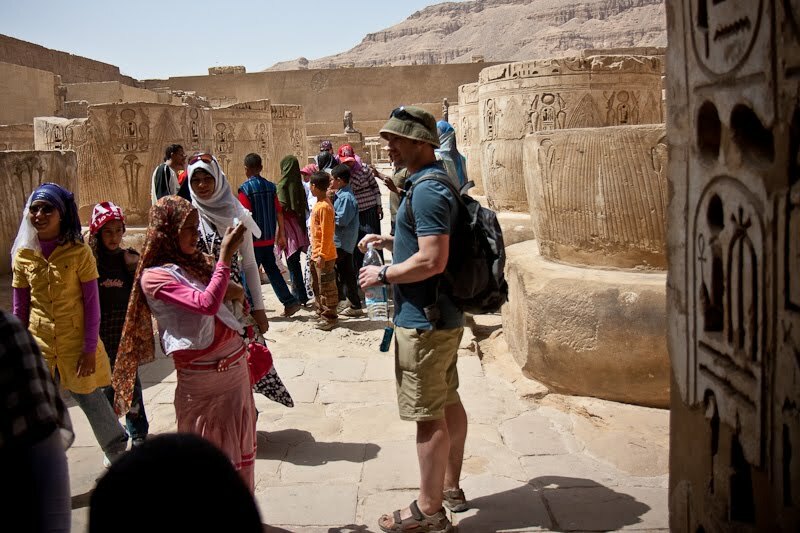 Our guide chose the best open tombs on the day, which were tombs of Ramesses I, Ramesses III and Ramesses IX. Before entering the site we had to decide on the optional tombs. We could see Ramesses VI’s tomb, which supposedly had magnificent paintings inside, or King Tutankhamen’s infamous tomb. Now you might question our choice, but King Tut’s tomb is said to be small, plain and mainly empty except for one of the gold sarcophaguses and his mummy. 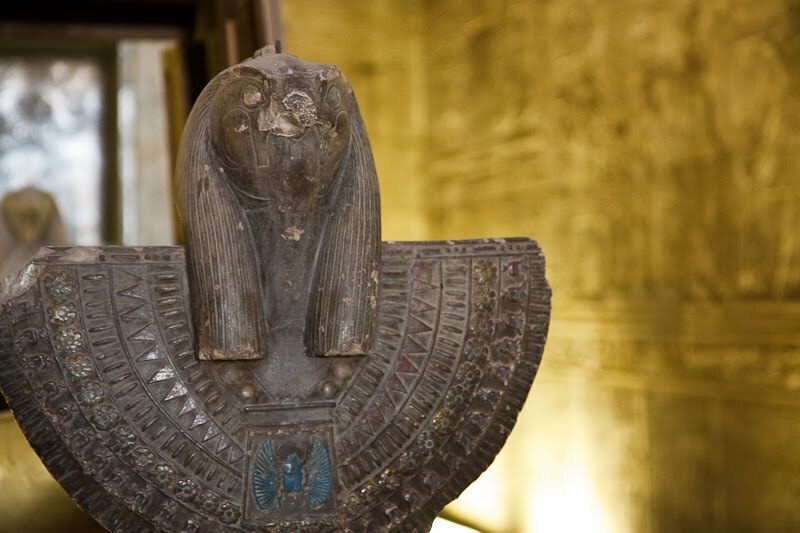 We had already seen the big tamale, the death mask, in the Egyptian museum in Cairo. So we opted for the tomb of Ramesees VI’s to see the detailed decoration inside the tomb. It was mighty cool and so well preserved. The colors were still so vibrant. The long half cylinder ceiling was decorated wall to wall with an incredible painting of the sky goodess, Nut. Unfortunately photos are not allowed anywhere in the valley and you can be royally fined if you are caught. 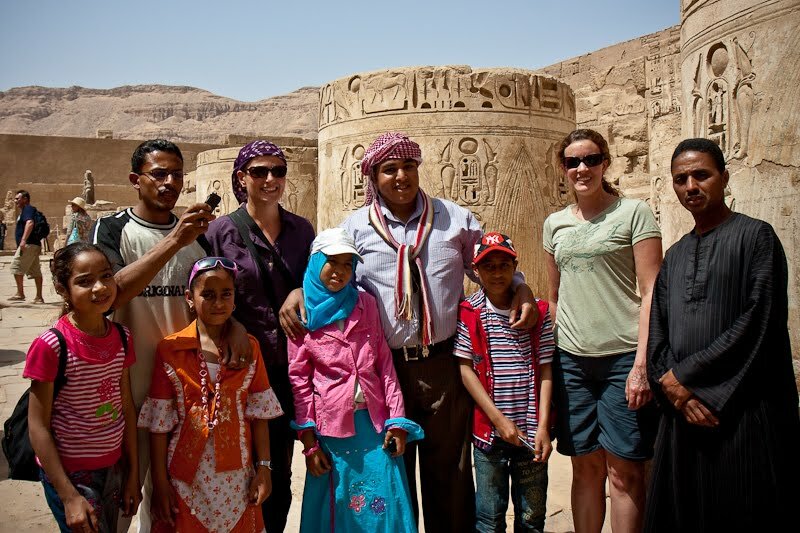 Afterwards, we were a little sad we couldn’t see both extra tombs…but that gives us a reason to go back someday! 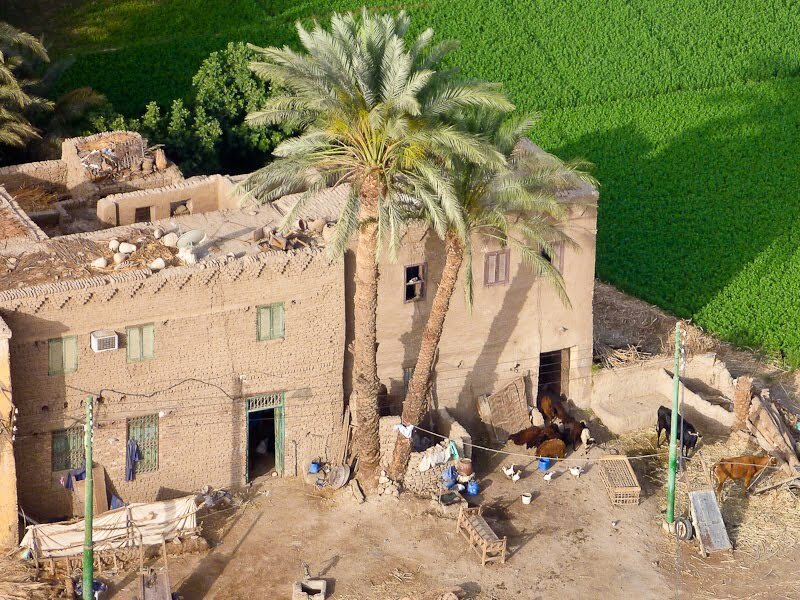 Here is an article on Ramesees VI's tomb to get an idea of what the tombs were like. All the tombs were fun to explore with some being in better shape than others depending on how the light and wind hit the entrance. They all had the same basic setup. 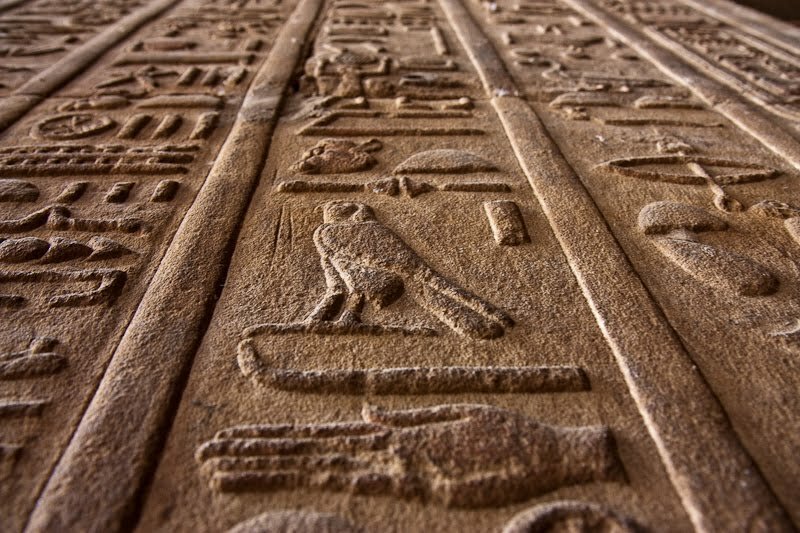 Upon entering the tomb you would walk down a ramp or stairs corridor with hieroglyphics, some colorful, everywhere. This lead to various other chambers finally culminating with the burial chamber where you would find the sarcophagus and statues. Here there was normally a roped or gated off area with a guard “keeping people out”. Only not really. The guard would always smile and open the gate whispering, “backshesh” (“tip”)! Haha! This was a normal Egyptian tactic and came as no surprise. It was the same at temples and other sites…even the “Tourist Police” weren’t exempt. They would approach you offering to take your picture and then ask for backshesh. One thing to know is that building the tombs was a huge honor but that honor came with a price. After signing up to work on the tombs you and your family were taken out of normal society to live in nearby camps due to security reasons. Tomb robbers were a big problem so to eliminate the location of the tombs being known you couldn’t ever go back. Ouch! Although it didn’t appear to work because the tombs were all robbed anyway. 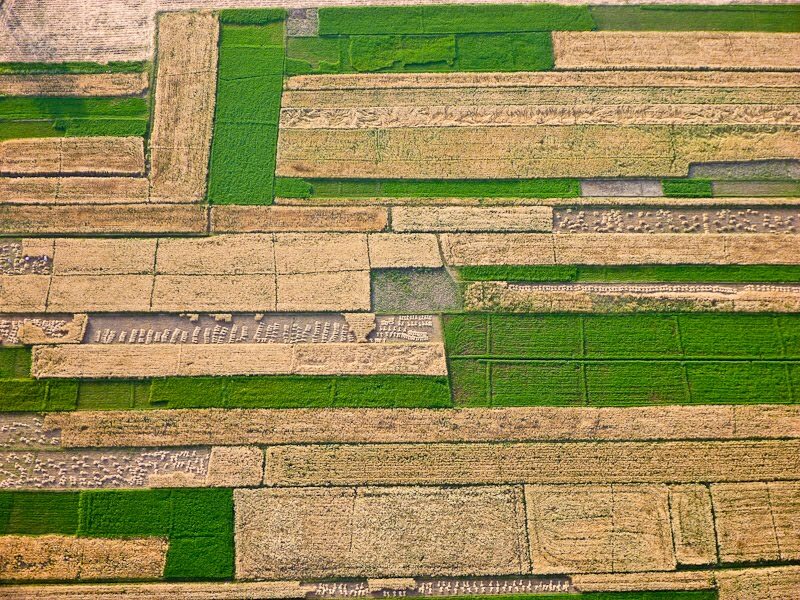 Even though the tomb builders were the best of the best they did make mistakes. In one of the tombs, the tunnel made a sharp right then sharp left – apparently in digging they accidently broke through to someone else’s tombs and had to divert the tunnel! Oops! One more thing not to miss is actually in the visitor’s center. There they have an excellent 3D model of the valley that shows the underground view allowing you to get a feel for the size and depth of all the tombs in the valley. Some were incredibly long and deep, while others, specifically Tut’s, were small and shallow. Sorry no photos, we couldn't risk the big fine! Another early morning saw us up at the crack of dawn to catch our flight – AKA our hot air balloon ride. With very few words being said, we all jumped in the bus and took a short drive down the road where we boarded a small ferry to cross the Nile. Apparently the only bridge was several miles away and they deemed this the easier alternative. The ferry ride was nice and they had a breakfast cake set out for each of us and provided tea or coffee. We quickly took advantage of some Nescafe! 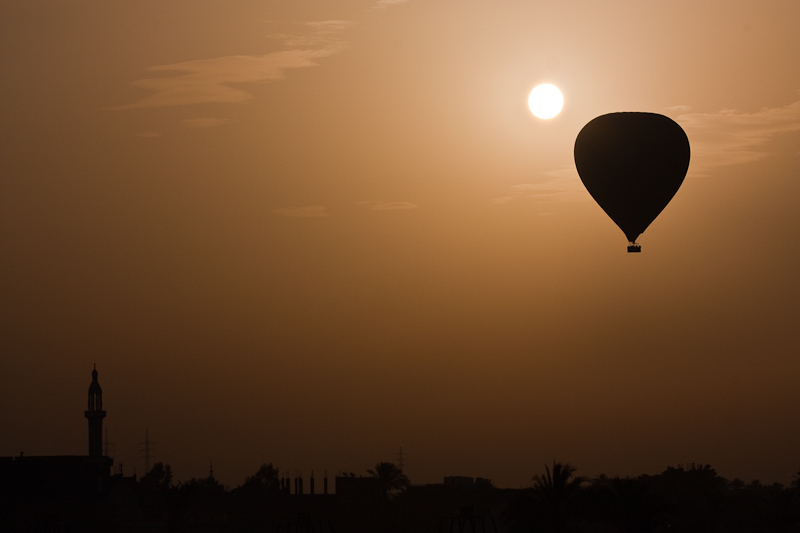 A few minutes later we jumped in to another bus to go to a big field on the outskirts of Luxor where a handful of balloons already dotted the morning sky. We had missed sunrise, but that was ok because the morning was clear and beautiful (minus some guy burning something a couple miles away). There was a buzz of excitement in the air as we walked up to our balloon (which held 20 people!). 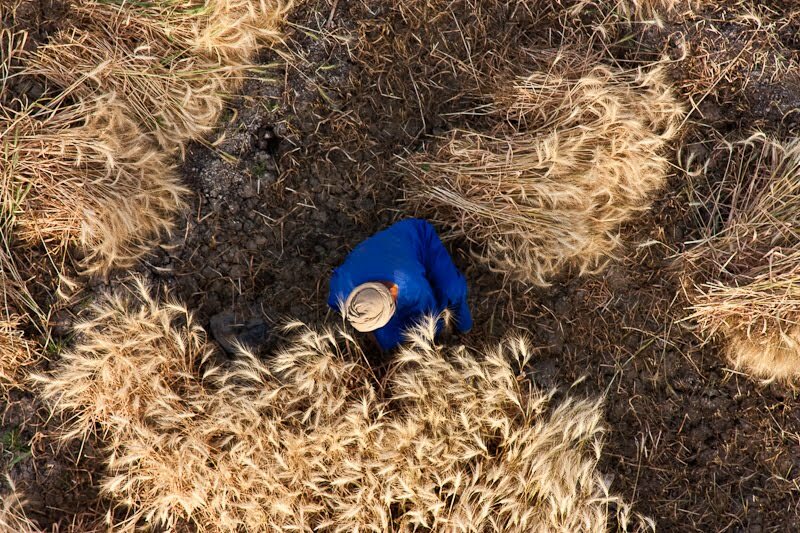 It was laid out flat on the ground with the large basket on its side. 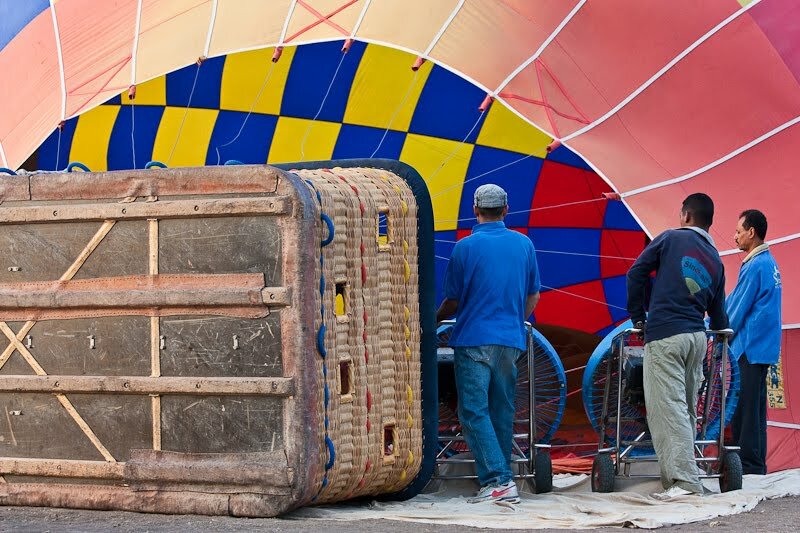 The balloon crew went to work as soon as the van doors opened, filling the balloon with air via two large fans. Soon enough it was time to start the burners – the initial fire burst grabbed our attention – with a big good morning! It was toasty even from a good distance away. Before we knew it, we were told to jump in – Josh first! He spiritedly jumped up to sit on the edge of the basket. As quickly as he was up, he was back down again falling like a turtle on its back thanks to wearing the backpack and holding the camera in one hand! A little too overeager are we? Everyone else made it in without a hitch and we took off! It was surreal to be lifting in to the air and see several temples and sights come in to view. 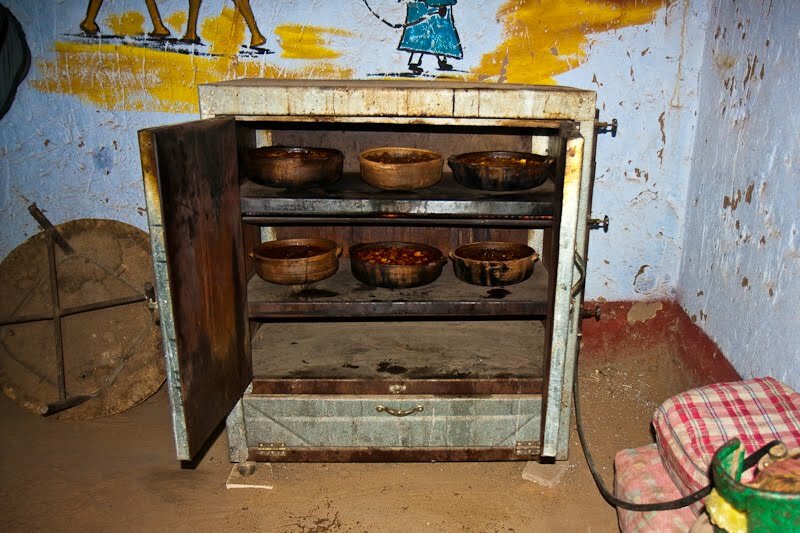 Oh, and the heat from the gas burners – yeah, it was hot! We had a great time floating and saw Hatchepsut’s Temple – a large and impressive temple but it looked small at the base of the mountain. On the other side of the mountain was the Valley of the Kings...we never got to see inside the valley however, we were lucky enough to see the Valley of the Queens due to our ride being longer than normal. We also saw the Ramesseum temple for Ramesses II and Medinet Habu for Ramesses III, as well as some other random temples and sights. 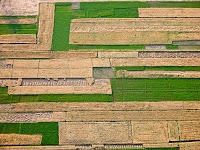 It was also great to float over the little towns and get a birds eye view of the farmers out that morning, the animals and just their general style of living. I had to have a good laugh when I saw a herd of sheep come piling out of a 2 story house! Fortunately, I caught that one on camera! It kind of seemed that the divide between animal and people space was thin. 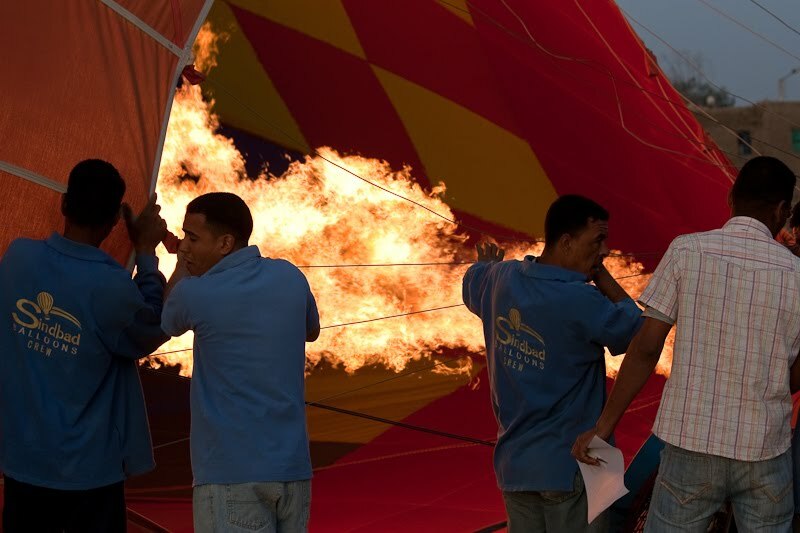 I mentioned already that our flight was longer than normal… well balloons are not quick and easy to land – they are at the mercy of the wind and the crew on ground to grab it and try to hold it down. After a lightning fast 30 minutes we started our descent…slowly, slowly, sinking, slowly, oh that little town is getting close, oh its getting closer and we aren’t going down that fast, oh we might land on that house, oh, oh, and fire! Rise, rise, rise! We cleared the house safely in that failed landing attempt – the wind won that one. We tried again and again had to abort because of another town…and again but aborted due to power lines…and then finally touched down in the desert area. The ground crew grabbed us, we landed softly then kept sliding along the ground and actually had to go back up again and go in for another landing before finally being firmly on the ground! Then it was a frantic effort for the ground crew to get the air out of the balloon so it would stay grounded. Excellent! Balloon ride over we piled in another van to start our day of touring the Valley of the Kings area. First stop, the Colossi of Memnon, two grand statues of Pharaoh AmenHotep III. The site was busy with quite a few tour buses full of visitors. One of the reason’s we chose Intrepid was because they specialize in getting you off the beaten path to see a really local side of the toured areas. This was a moment where it paid off. All the visitors climbed back on their buses and took off for the Valley of the Kings. We, on the other hand, walked a couple minutes around the corner to find a nice surprise; donkey’s waiting to give us a ride! 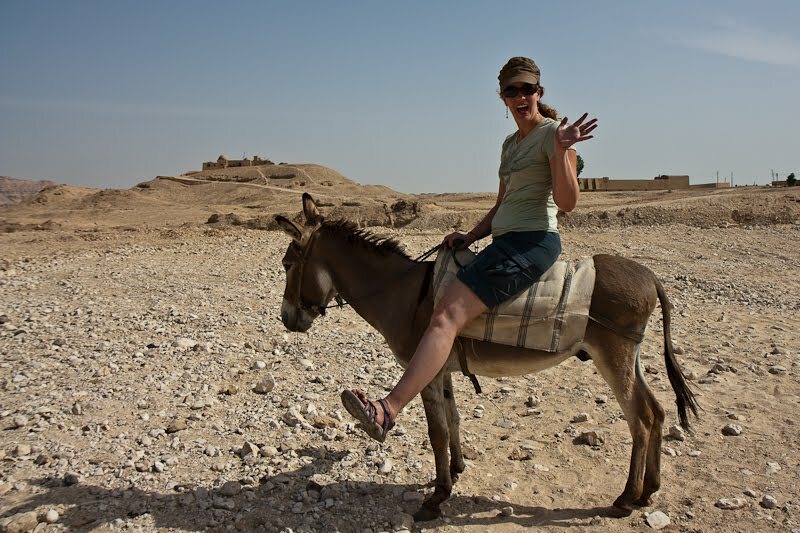 We had been waiting for this since we booked the trip; how often does one get to ride a donkey? One thing we learned about donkeys is that as soon as you hop on they are ready to go! So after mounting our donkeys, which meant struggling to gain our balance, having to kick our legs out side ways, off we went. The ride was a bit wobbly until we got the hang of it but far more comfortable than camels. 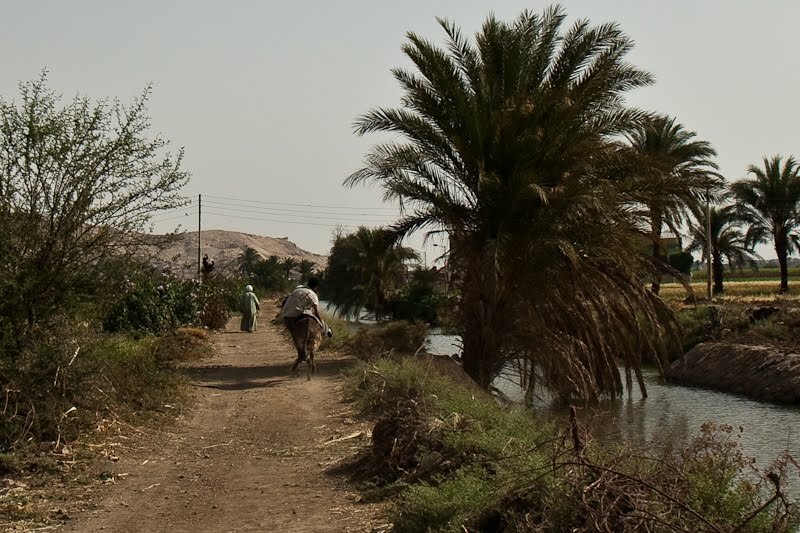 We rode on a little dirt road through some farms and countryside that was green only because of the Nile and their extensive irrigation. We greeted the local passers by with “Aasalaamu Aleikum” – with our bad accents, we hope it properly translated to “hello”. Josh’s donkey was no slouch and took off from the start, never looking back. In an attempt to catch up Sam got a little carried away and his saddle started slipping. Sure enough off he went! Luckily he landed on his feet because the donkey was temperamental and bucked his back legs as Sam hit the ground. 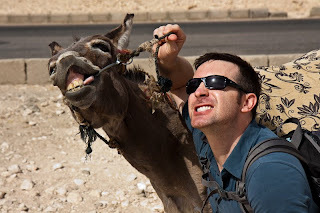 The donkey took off into a field with the saddle around his belly and had to be chased down by a donkey caretaker. The donkey ride was such good fun. 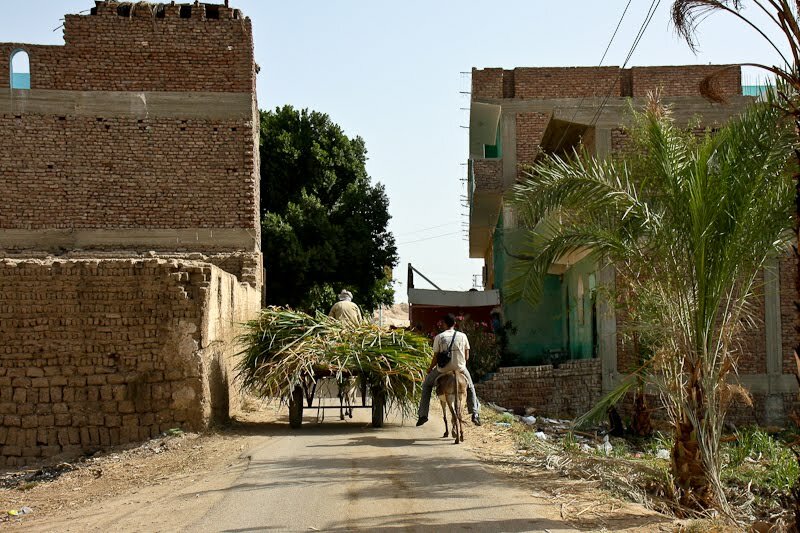 Enjoying the morning in the Egyptian countryside while trying to keep your donkey from stopping for some local fast food (grass), keeping it going where its supposed to go and keeping your balance all at the same time kept a smile on our faces. One of the donkeys was a talker and kept hee-hawing at the other nearby donkeys which only added to the scene because when they talk they are loud – HEE HAW! The van ride to Luxor had an entertaining start. Imagine us rolling off the boat shortly after sunrise and breakfast...and some of us being a bit tired after being subjected to snoring on board.... Well, that grumpy morning attitude didn't stick long thanks to our bus driver - DJ Mohammed. He was a tall portly fellow with a big smile and huge laugh. After the bus doors closed, we found out his taste in music was Arabic techno - good morning! So while weaving, honking, and going around anything in his way that moved (AKA “Egyptian driving”), he blasted his techno music. He would be pumping the volume up and down as if he were scratching 45's in a club and even started pumping the breaks and turning the interior lights on and off! All along letting loose huge bellowing laughs. Even our tour leader Sam, at one point looked back and said "Mohammed is crazy" to which Mohammed responded by screeching the van to a halt, pointing out the door and yelling “Get out”! A lot of laughs later we tore off again towards the Valley of the Kings, music still blasting! 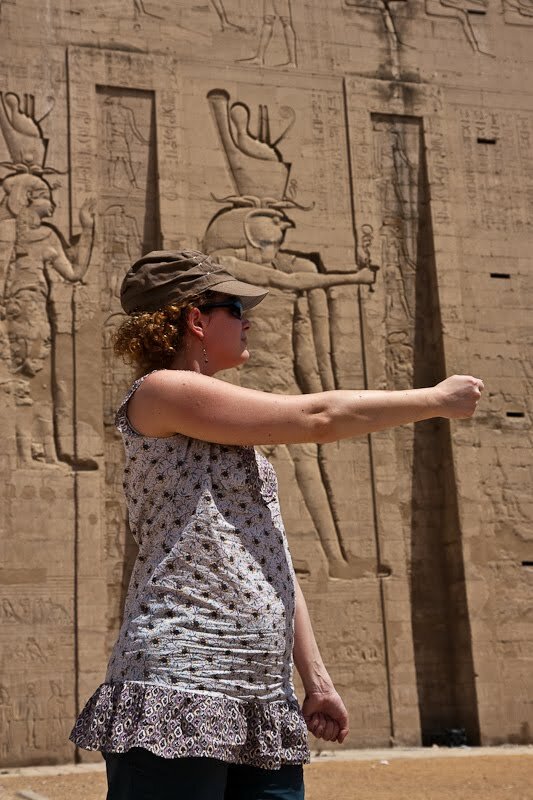 To break up the drive to Luxor we made a stop at Edfu's Temple of Horus, the god of war and hunting. One thing if you didn't know already is that Egypt is full of tombs and temples ( although they think only 30% has been discovered! ). 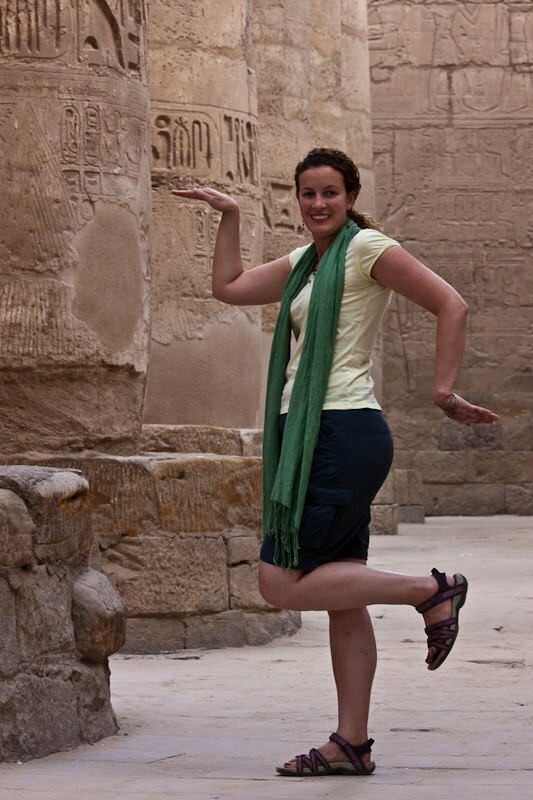 Little did we know at the time but Edfu is one of the most completely preserved temples in Egypt. It also has a cool alter shaped like a boat along with what I called the Nile’o’meter. A set of stairs that led to water used to measure the level of the Nile. 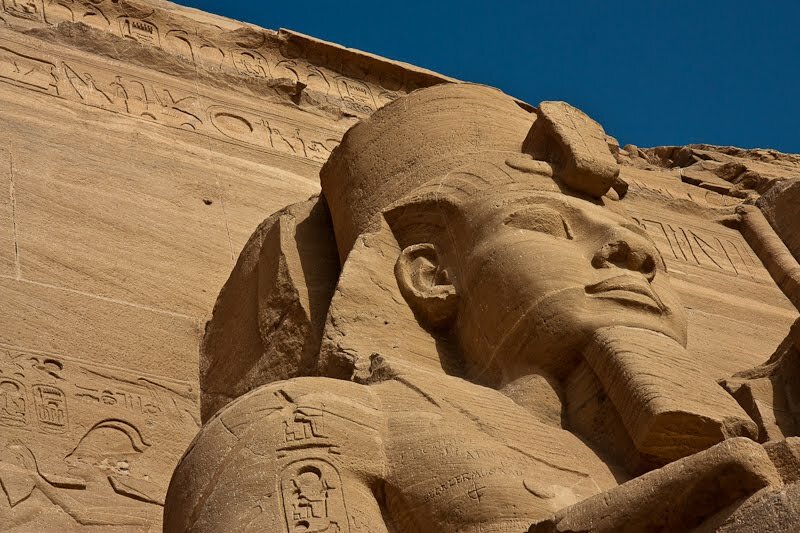 It was incredibly detailed in its carvings and hieroglyphics – it was a great stop! 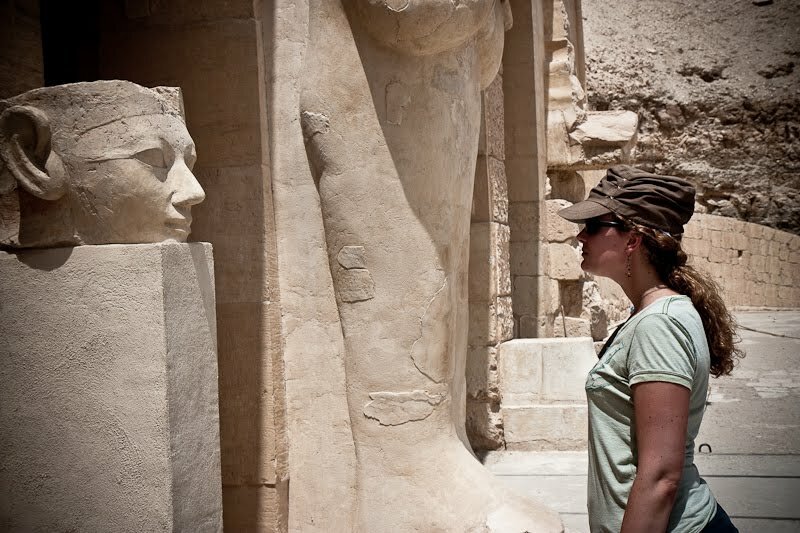 Once we arrived to Luxor we went straight for one of the best sights on the tour, Karnak Temple. 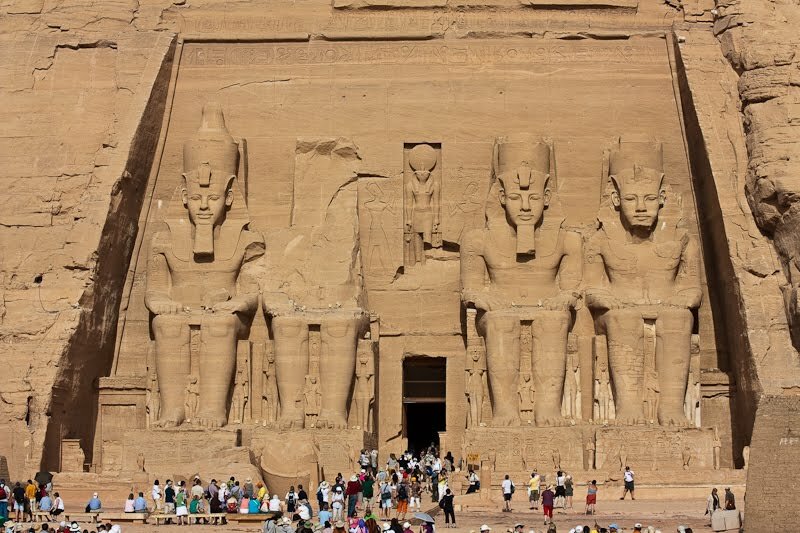 The pharaohs used this massive temple complex to be remembered in history. 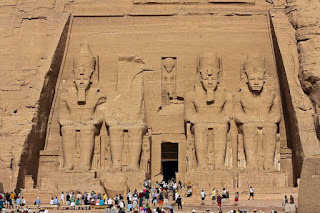 Around 30 pharaohs expanded it over the years so it is enormous. 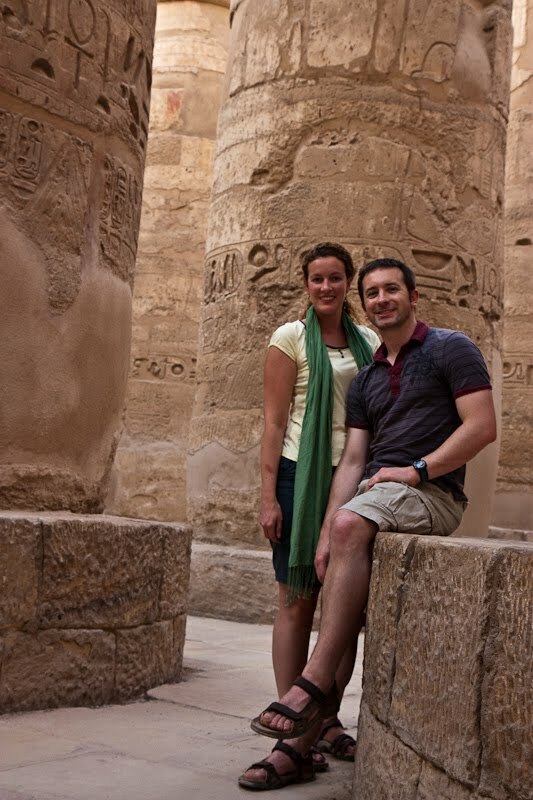 The most impressive attraction is a room of columns called Hypostyle Hall installed by our good friend Ramses II. And I’m not talking about a handful of nice skinny columns….I’m talking about massively wide and tall columns. Check out the stats of this impressive space on Wikipedia. One other cool thing was the scarab statue ( dung beetle statue ). It is said that if you walk counter-clockwise around it once you get health, twice you get love, three times for wealth and more laps for some other things…we went for health - it was hot, lol! As we were heading for the exit we ran into a group of Egyptian girls who were getting photographs of their group. I asked if they wanted me to take the picture and they politely allowed me to. Once I broke the ice they were fascinated with us. Among a lot of staring and giggling were at least 10 photographs….with us! Funny enough we were as fascinated with them as they were with us. This actually became the trend over the next few days at temples. You all had no idea we were celebrities, right?! After a long day we headed into Luxor for a dinner with a view overlooking the Luxor Temple and enjoyed the food but most off all the fresh strawberry juice. It wasn’t far off Grammy’s homemade strawberry preserves in a glass! Delicious! We had to hit the sack early again that night as we all signed up for a sunrise hot air balloon ride the next morning!! 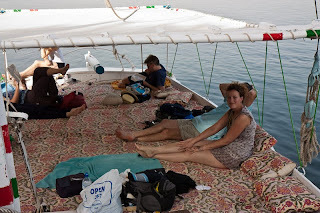 In the morning, we boarded our felucca – a sailboat with a simple flat deck, complete with padding, pillows and a tarp over top so we could lounge in simple, shaded luxury down the Nile. 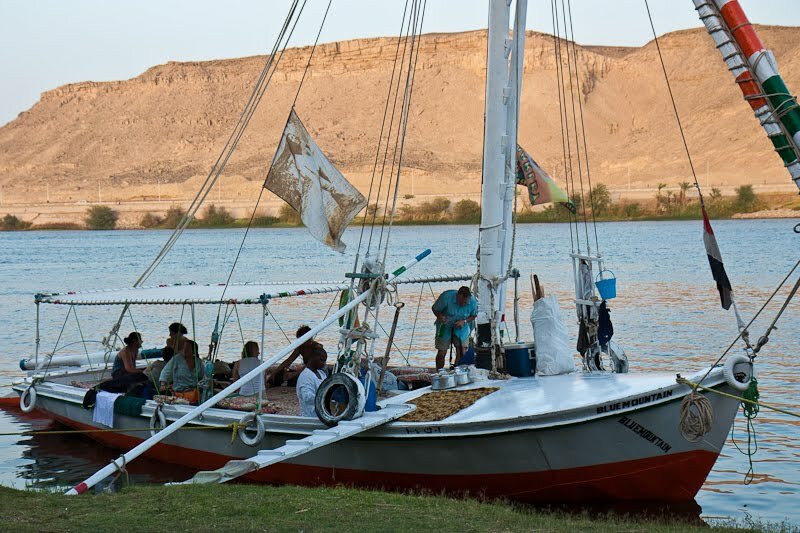 Aswan was brutally hot but it was amazingly cool with the constant breeze as we sailed. The whole day was meant for sailing and we would park for nighttime. This worried us bit as we thought we might get bored being on a boat all day long, however the day literally breezed by! 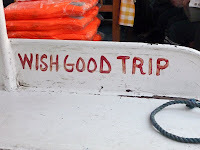 We did a bit of snoozing, stopped for a swim in the Nile, a bit of ipoding and conversed with our fellow travelers. It was also quite entertaining to watch the captains tilt the mast so we could slide under a bridge. 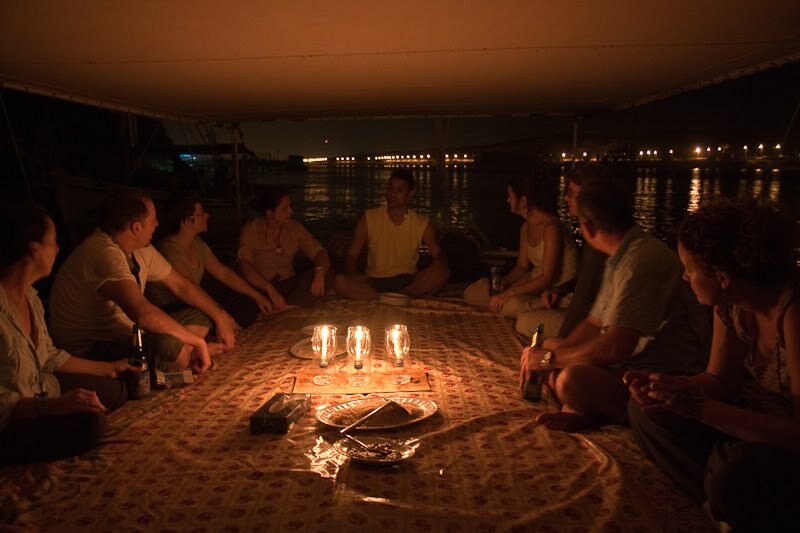 The felucca also had a tiny little space representing a kitchen – just a two-burner gas stove top and a 1.5 man bench where one of the two boat captains sliced and diced lunch, dinner and the following morning’s breakfast. And what a feast he could prepare! Combinations of rice, mashed potatoes, veggie stews, fried fish, fried chicken, soup, pita bread and more! Yum! We were also really enjoying the company of our tour leader Hossam (or Sam, as we call him for short). He is Egyptian and just a fun guy to be around. At one point during the cruise he taught us how to write our names in Arabic. We were also all given an Arabic number to remember. Josh is demenya ( 8 ) and I am khamsa ( 5 ). Fun. Before we knew it, it was time to anchor for the night at shore. All of the men were summoned to “build the temple” – AKA the toilet. 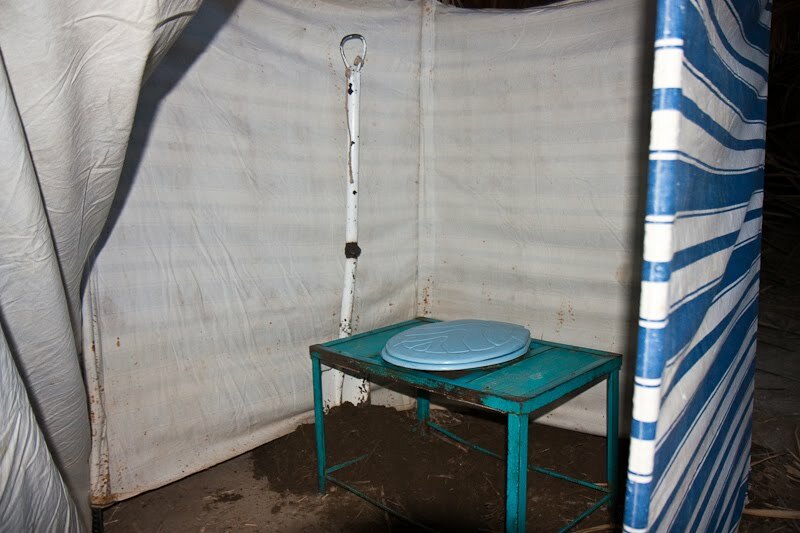 They had to dig a 3-4 foot hole, over which they placed a metal-framed box with a western toilet seat screwed to the top. I have to admit, I was rather excited to have this little luxury instead of using the woods. We had our dinner with candlelight, thanks to some clever lanterns made from the empty 1 liter plastic water bottles….it was the perfect touch (plus, there really wasn’t any electricity so it was the only choice!). There were a couple other boats anchored with us so the evening was lively with several of the captains pulling out their drums and singing. But due to our stressful, long day (not!) we were happy to pull out the sleeping bags and call it a night. Everyone set up camp across our padded deck and we slept soundly (except for a bit of snoring from a couple people on board). 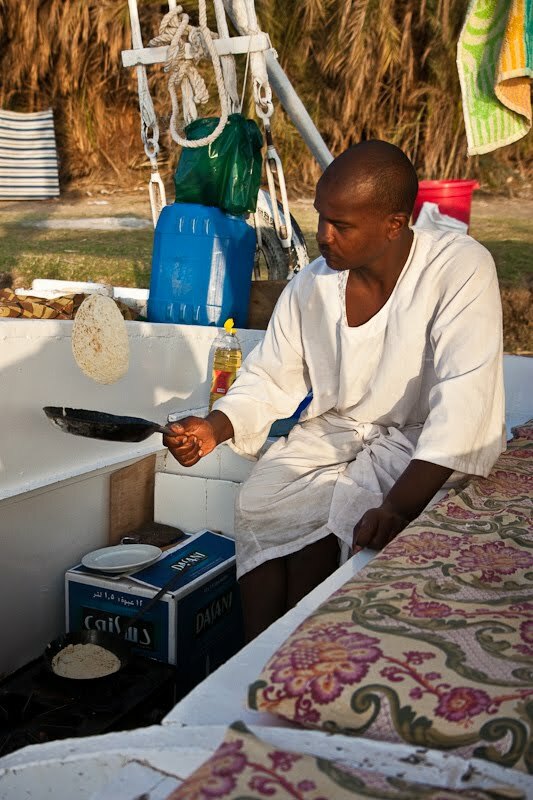 The next morning we were all up early at the sound of Mohammad, the second captain / chef, making breakfast – crepes! We had delicious crepes with honey, cheese and jam. And we even had our daily cups of coffee. 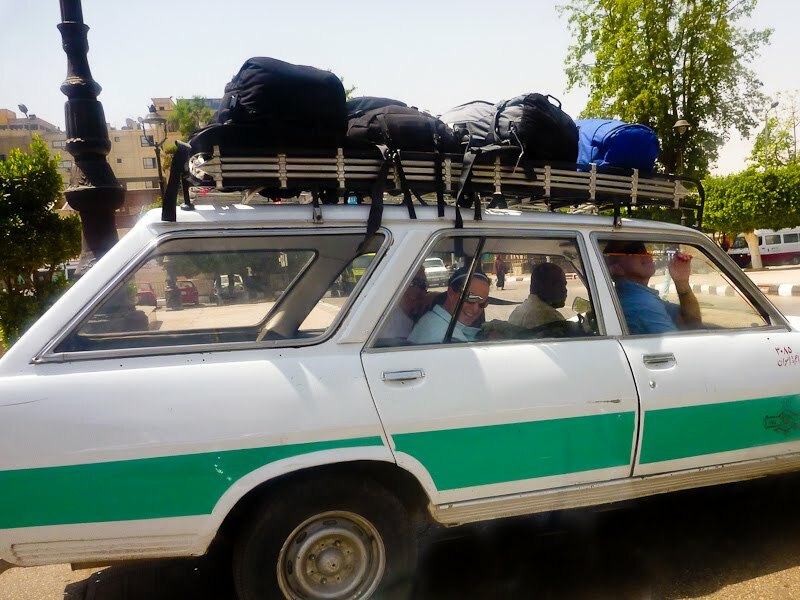 But all good things must come to an end, so we all packed up, our boat crossed to the other side of the Nile and we jumped in a bus to take us to Luxor. After our Nubian dinner we went to bed early because we had to be up at 3:45am to catch our 4am convey through the desert to Abu Simbel. It was a three-hour drive so we borrowed our hotel pillow to accompany us on the journey. 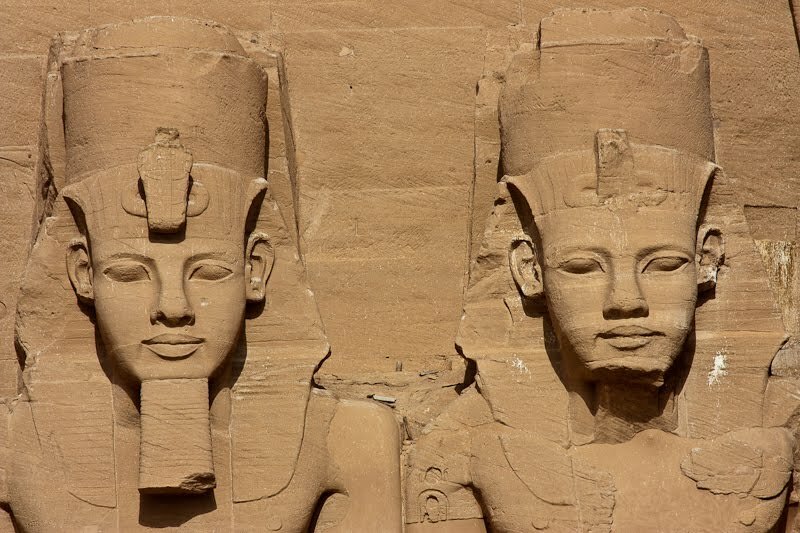 Abu Simbel is a pair of temples built by Ramsees II and is a monumental site in two ways. First, the engineering and scale of the main temple is just mind blowing. 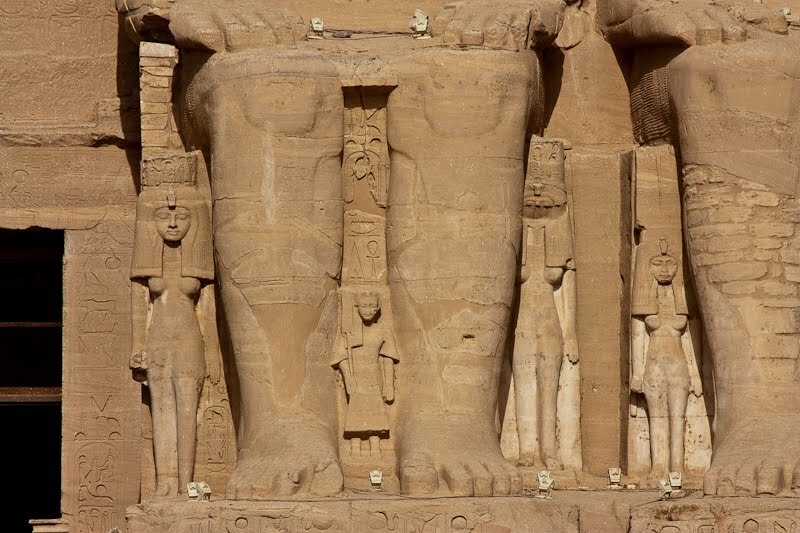 There are four grand statues of Ramsees himself at the entrance that lead to a corridor lined on both sides with more statues of Ramsees, smaller but still larger than life. Finally the temple's alter room which has three seated gods and Ramsees that are magically only fully lit up by the sun coming through the doorways on one specific day of the year. Sorry no photos allowed inside the temple so here is article with some interior photos. Second, the temples were actually moved from their original locations. Every piece was meticulous cut up and moved in preparations of building the Aswan dam which was needed to help regulate the Nile floods. You can see the new lake behind me in the photo that covers the original site. They even built a fake mountain to house the temples as it originally was designed. Seeing it on TV, you would have no idea it was moved and actually in person, it is only apparent in certain places. Regardless, it is impressive that they moved this massive monument and were able to do it with such precision. 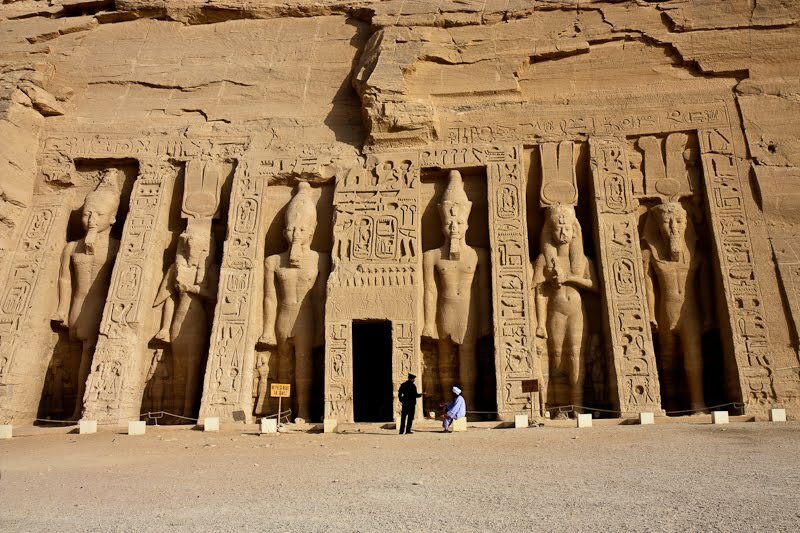 Oh, and the second temple for his queen, Nefertari, is nearly as impressive – he must have loved her although he does make quite a few appearances in there as well. It was also a good thing that we were there so early in the morning, because if I hadn’t mentioned already, it was scorching hot in Aswan and there is no hiding from the sun at the site. Jumping back on the bus was a relief, saving the hottest part of the day for the bus ride. One convoy back to Aswan please. At this point in our trip our efficient packing starting to take its toll…yep, we needed to do laundry. 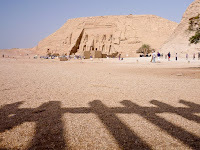 That was the first priority when we got back from Abu Simbel. Fortunately with the hot, dry heat it was perfect laundry weather! After laundry and a quick nap, we headed to the local bazaar to entertain ourselves. It was a long, winding bazaar and and all the shops are all full of the same stuff. At one stall we meet a young boy named Mohammed, who was very persistent and spoke English well. He followed us for the next hour or so, as we were in and out of shops, trying to sell us bookmarks. After he got the hint that we weren’t in the market for bookmarks (and that we weren’t simply going to give him money-for-nothing) he proceeded to try and get us to go to his Dad’s shop which we finally agreed and took a look in his shop called Nubian smile. The quote of the day from the bazaar was, “What you want lady” as Steph got that a couple times as she looked at some tunics. Oh and good luck with the bookmarks Mohammed. 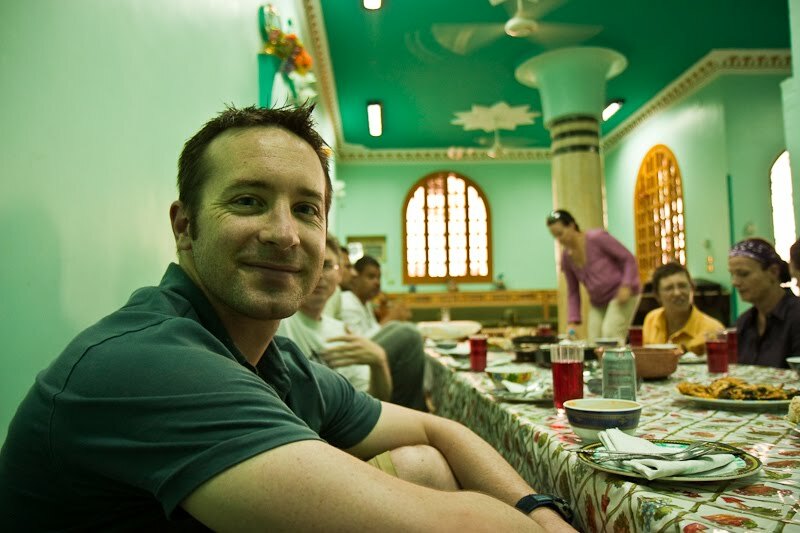 After touring the bazaar and not purchasing anything we retired early in preparation for our felucca sailing the next day! One final photo of Aswan at night. 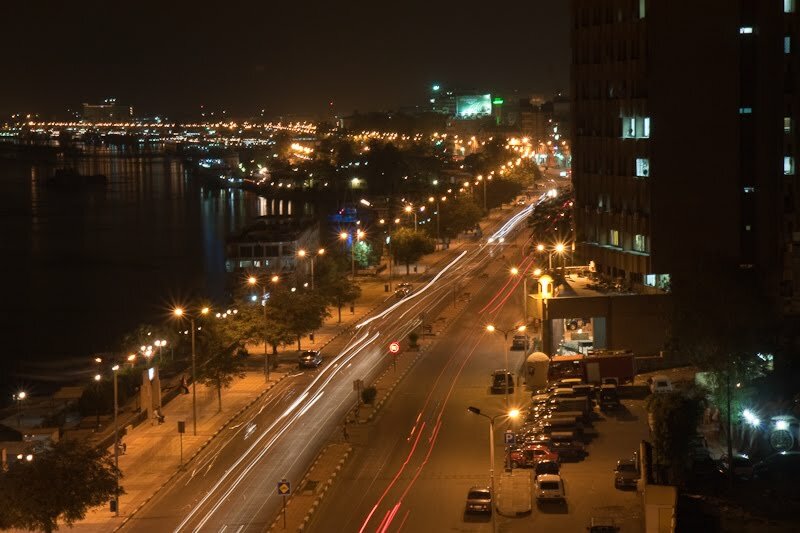 Check out the light trails to see the crazy drivers of Egypt. Well, as we suspected the second leg of our flight was indeed cancelled due to England airspace still being closed from the volcanic fallout. Our flights were supposed to be from Amman to Istanbul, then Istanbul to London (Heathrow). So, we changed our flight with Turkish Air this morning at 3:30am (before we got in a taxi to go to the airport...because we woke up to find our second flight canceled and wanted to deal with it immediately). The only real option for us was to accept a flight to Birmingham, just northwest of London....but the catch is that this flight is not until NEXT Sunday! Yep...a whole week. They said it would be the end of the month before they could fly us to London. But the 25th nearly is the end of the month already! Yikes. So, we got to Istanbul quite simply, jumped on the wifi in the airport once we got there....did some hotel searching, got a map from the tourist help desk and we have scored an awesome hotel with a view of the Blue Mosque for super cheap. The room is amazing! A mosaic on the wall, wood floors, nice plush linens, lovely bathroom and even slippers and two pieces of turkish delight on the bed! We've started on a good foot in this bad situation! 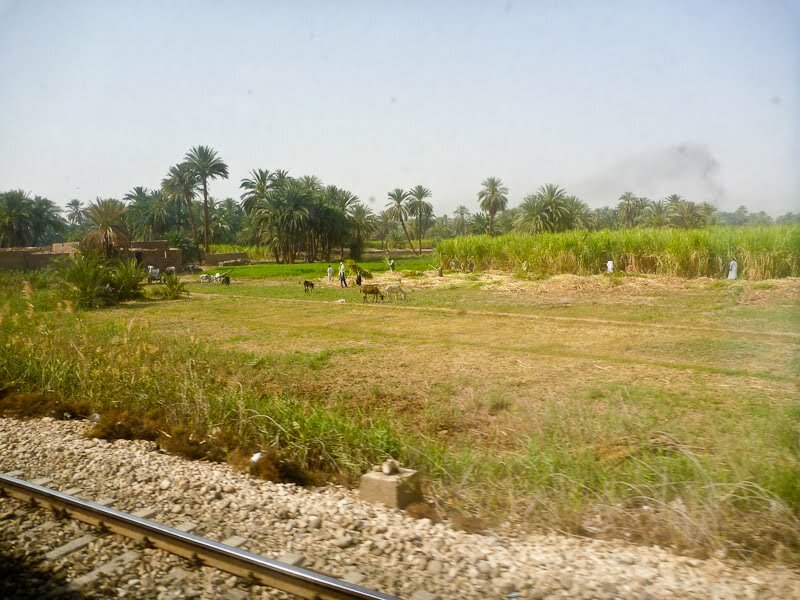 We had a sleeper train from Cairo to Aswan and it was great! A cool little cabin with two twin beds that folded down and even a sink and mirror station cleverly hidden behind a door. We had a cabin attendant that promptly served us dinner as the train started moving - perfect timing. We slept pretty well after I fought with the metal ladder that kept rattling against the wall (I just put it on the floor and decided if I needed down, I would jump...or step on Steph). In the morning, we woke up to rural scenery and a breakfast of mostly bread (they are heavy on bread at breakfast). 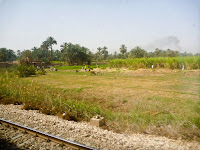 The train pulled into Aswan station and we jumped off now 13hrs further south in the desert. The group needed 3 taxis but instead of driving one after another in an orderly fashion, the taxi drivers, with a little encouragement from me decided to see who could get there first, driving 3 abreast at times and late breaking for speed bumps. Who cares about the luggage on top! One of the fun Arabic words we have learned thus far is Yalla Yalla or “lets go, lets go”. The taxi drivers had fun with this one. Oh and the taxis were fantastic, green striped 70’s station wagons. After a quick briefing at the hotel we headed to the waterfront to catch our motorboat tour on the Nile of Elephantine Island. Luckily this was a covered boat because even though it's springtime the heat is still intense. 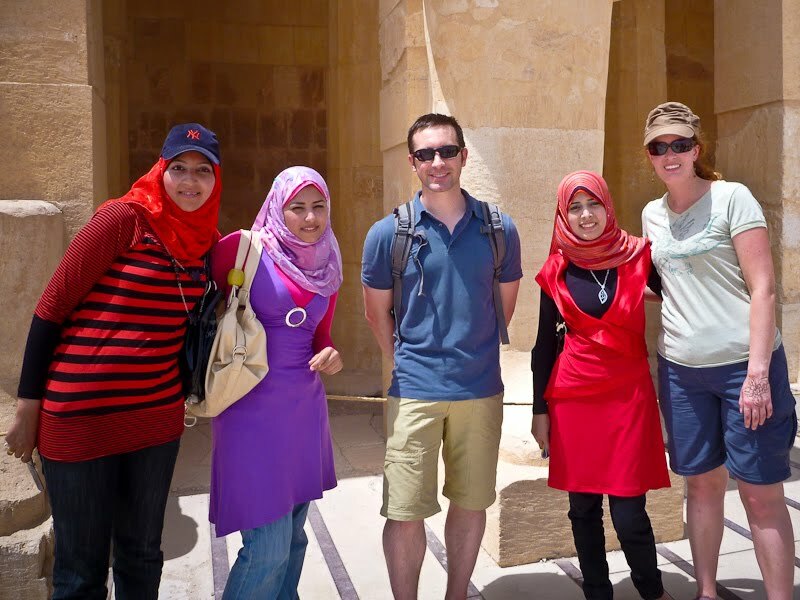 One thing intrepid tries to do is allow you to meet local people at certain times in the trip. In this case we would be guided on our boat ride by a highly regarded elderly Nubian man. He's in the picture above. Although he needed a cane to help himself get around he was sharp as a tack with his wrinkly smile, curved fingernails and lively personality. He quizzed us about our own countries. A few of the US universities have sent students to be taught by his wisdom. 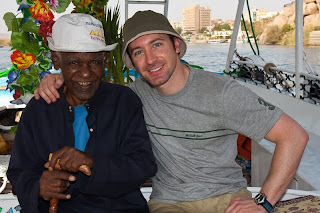 I can’t describe the pleasure it was to meet him as we cruised around the island looking at the sights. Relaxing sightseeing over it was time to get the heart pumping with a monumental sand dune climb. 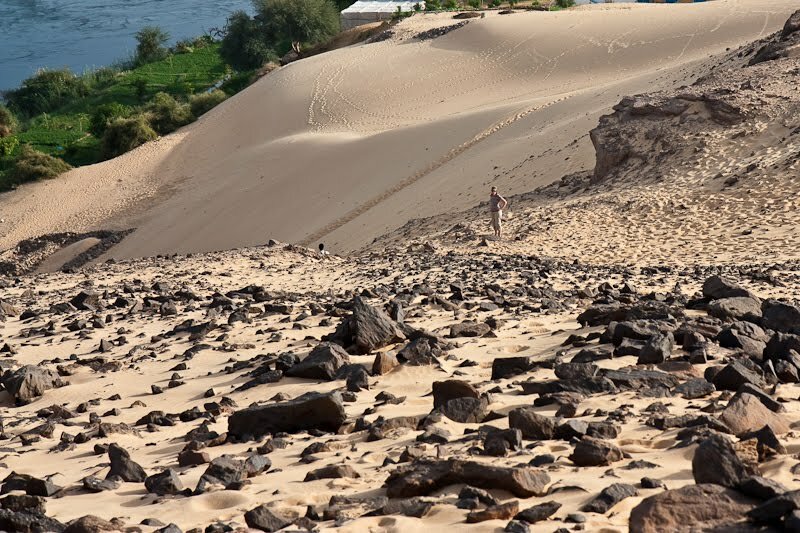 As we jumped out of the boat our tour leader Sam said, “ “Which route up are you going to take?” Should we take the long route that wound its way up the dune or the short route straight up but half the distance? In hindsight our choice wasn’t best because the short route was an absolute mission! We realized it about half way up bare feet sizzling in the sand and heart jumping out of our chest. For each step up we slid back down half that distance. However at the top after catching our breath and guzzling some water, we were rewarded with some spectacular views. 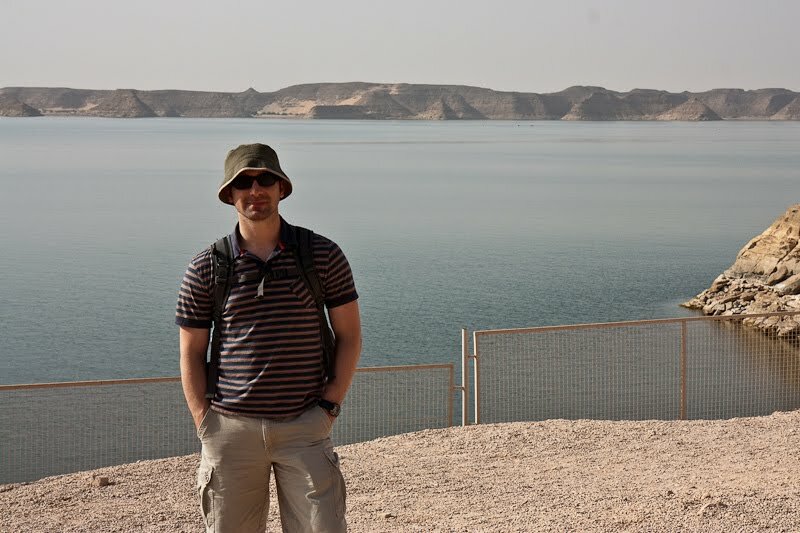 We could even see the Aswan dam that some may be familiar with. Now the fun part, running back down, legs and arms flailing we hit the bottom where one final treat helped us cool off. 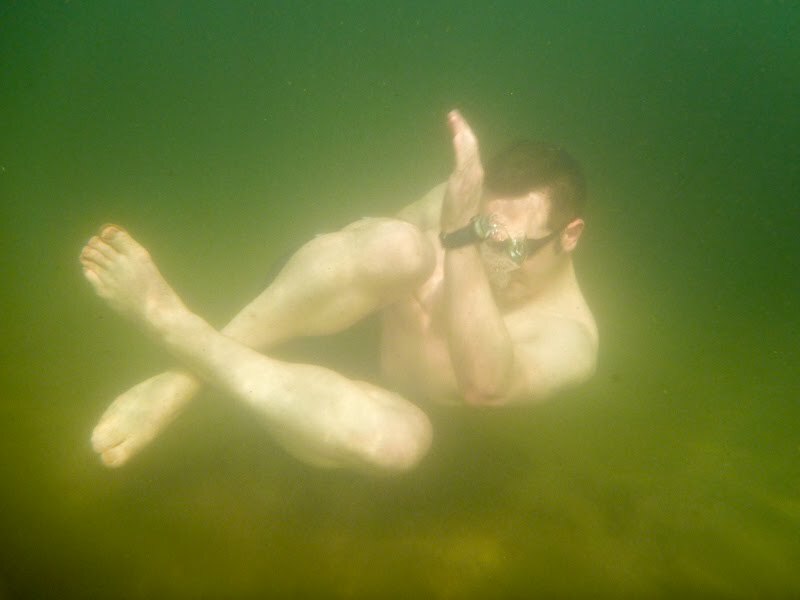 A dip in the Nile. 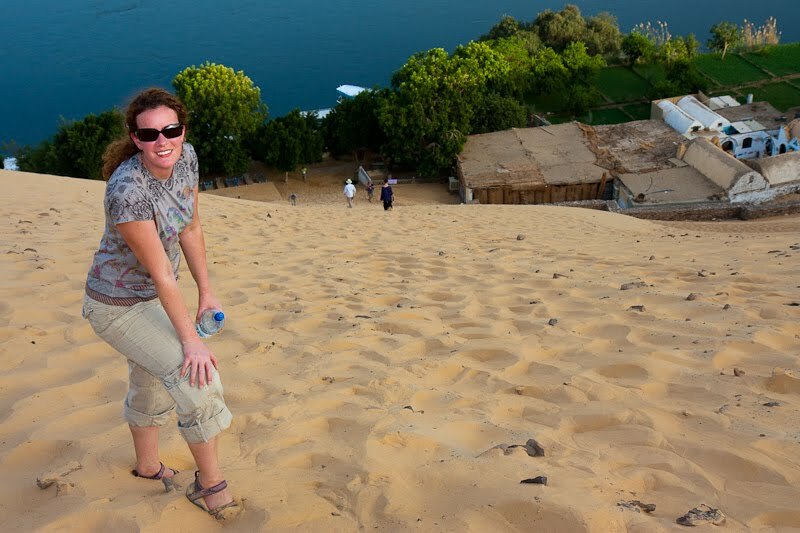 For as hot as it was outside the Nile was surprisingly freezing (but felt good after the climb)! For dinner we sailed to a Nubian village to have dinner prepared for us by a local family. The food was tasty, cooked in modest kitchen. See some of the food cooking below. Gathered around the food, sitting on a huge rug, we feasted until our stomachs were stuffed. The night was capped off with a little traditional music and dance. 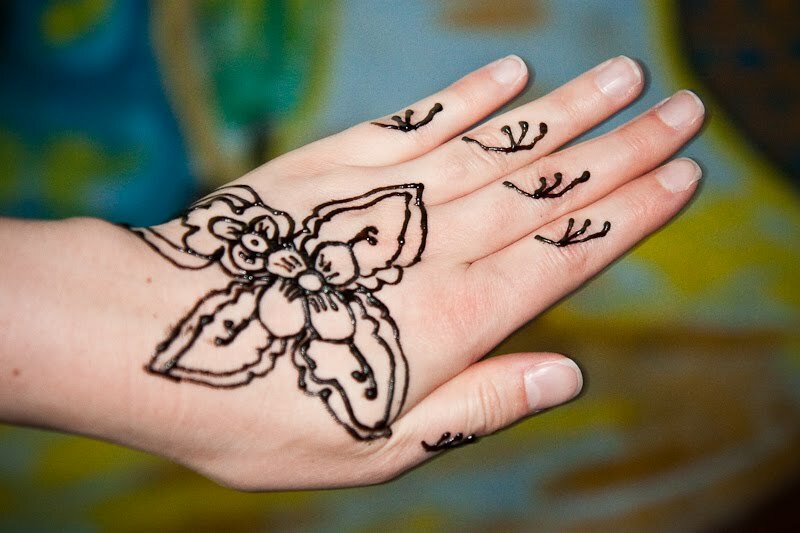 Steph scored a henna tattoo as well.